The Cama-i Dance Festival marks one of the heaviest travel weekends along the Kuskokwim River to Bethel, but that river ice is rapidly melting. It’s only half the thickness it usually is for late March and is growing thinner every day. “We’re losing about 0.8 inches of ice a day, so breakup can kind of happen at any time,” reports Bethel Search and Rescue volunteer Charles Guest, who's been measuring the ice daily. In many areas, the thickness ranges from 8 inches to open water. These rapidly deteriorating conditions follow the warmest winter on record for the Yukon-Kuskokwim Delta. The forecast for the coming week shows highs reaching 51 degrees and is set to create another record: the warmest March ever recorded in the region. BSAR volunteer Mark Leary has also been measuring the ice. He knows how hard it is to change plans when people are used to traveling this time of year. On Sunday, BSAR issued an advisory that no further truck or car travel is recommended on the river. 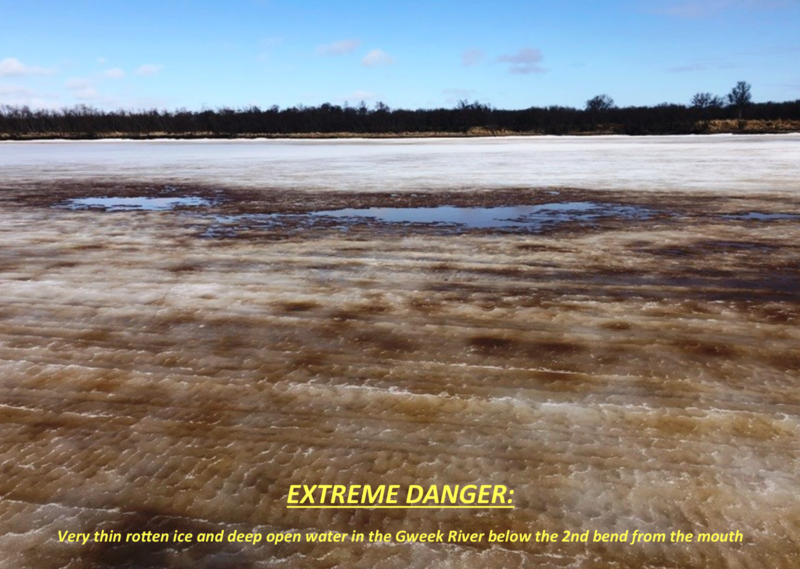 Less than a week later, the group is recommending people on snowmachines or ATVs to travel with “extreme caution.” Leary warns that many conditions are different this year, making the ice difficult to read. “One of the ways that we were trained was stay away from the darkest areas, and white ice is safe. But that’s not the case this year,” he said. Already, much of the ice has turned black, a sign that it’s too thin to cross. Also different this year is that the ice potholes often have no bottom. The Johnson River has open holes before some areas of the Kuskokwim River. And the stronger shore ice along the tide crack is perforated by drain holes big enough to catch an ATV tire and throw its driver. Leary said that warning used to be true in late April or early May during bird hunting season. Now people are wondering if there will be any ice left when that time comes. BSAR advises travelers to travel with a buddy, to only travel in the daylight, and of course, to travel sober. The upper end of Straight Slough has gotten 5 inches thinner since Saturday. It is only 7 inches thick. All ice that was drilled is soft. The Gweek River ice is thin, rotten, and opening up from the second bend all the way out to the lower tip of the big (Pavilla’s) island on the main Kuskokwim. The east side of the Kuskokwim below the Y and across from the upper end of Church Slough is only 4 to 6 inches thick. The ice, however, is deceiving, It looks white, but is very thin and full of small open holes. Kuskokwak Slough above Kwethluk is only 6 to 8 inches thick through most of its length. The Akiachak Channel just above the Y has gotten 4 inches thinner since Saturday. It is only 8 inches thick in this area. The lower end of Church Slough below the little short cut slough is wide open with strong current. Napakiak Slough has open holes.